In this weekend's premiere of Milk Street Kitchen, Christopher Kimball explored a Chinese approach to home cooked meals and learned how to make Chinese white-cooked chicken with ginger-soy dressing, and a hot oil-flashed chard with ginger, scallions and chili at home. In the premiere of Milk Street Kitchen, Christopher Kimball visited world traveler and cookbook author Fuchsia Dunlop in London to learn about the Chinese approach to cooking, and learned how to get perfectly cooked chicken every time. The trick? Focus on the meat; not the skin. Those techniques got put into action when Milk Street Cook (and Craving Boston alum) Catherine Smart showed Chris how to make a delicious Chinese white-cooked chicken with ginger-soy dressing. Chris also demonstrated why an Asian cleaver just may have the edge over the ubiquitous western chef’s knife. The show ended with a little sizzle on set as Milk Street Cook Mathew Card showed Chris how to make hot oil-flashed chard with ginger, scallions and chili at home. You can watch the episode here. And we've got the recipes from this episode below. It's your turn to get a little worldly in the kitchen! Catherine stuck to the the traditional Chinese technique of plunging the cooked chicken into an ice bath after poaching, which is said to tighten the skin, but found little advantage. She also tried “flashing” the scallions and ginger with hot oil before making the dressing but liked the brightness of the raw aromatics better. Cutting the saltiness and potency of the dressing with some of the poaching liquid was preferred. Remove the chicken from the refrigerator and let sit at room temperature while making the broth. Reserving a few sprigs for garnish if desired, cut the cilantro bunch in half crosswise, separating the stems and leaves. Use kitchen twine to tie the stems and scallions into a bundle. In a large pot (at least 8 quarts), combine the cilantro-scallion bundle with the remaining broth ingredients and bring to a boil over high heat. Using tongs, lower the chicken into the broth breast side up, letting the liquid flow into the cavity. If the chicken isn’t fully submerged in the broth after flooding the cavity, weigh it down with a plate. Allow the broth to return to a boil, then reduce heat to medium and cook for 25 minutes, adjusting the heat as necessary to maintain a bare simmer; flip the chicken to be breast side down after 15 minutes. Turn off the heat, remove the pot from the burner and let the chicken sit in the hot broth for 30 minutes. Transfer the chicken to a carving board and let rest for 15 minutes. While the chicken rests, prepare the dressing. In a small bowl, stir together 1⁄4 cup of the poaching broth, the scallions, soy sauce, vegetable oil, ginger, vinegar, sesame oil and sugar. Using a sharp knife, remove the legs from the chicken by cutting through the thigh joints, then separate the thighs from the drumsticks. Carve the breast meat from the bone and slice each breast crosswise into 4 pieces. Discard the chicken skin, if desired. Spread the cabbage on a serving platter, then arrange the chicken pieces on top. Pour the dressing over the chicken and sprinkle with the reserved 1⁄2 cup of chopped cilantro. Garnish with cilantro sprigs, if desired. Serve warm, cold or at room temperature. if any, actual sherry flavor. Look for a high-quality (but affordable) dry sherry, and keep the remainder refrigerated to use in pan sauces, soups or even cocktails. Mirin, a rice wine, is a decent stand-in and usually is available in the Asian foods aisle of the grocery store. If possible, opt for hon-mirin over the sweeter aji-mirin. Blanching the greens in boiling water cooked them quickly but also left them tasting watery even when squeezed dry. A hybrid steam-sauté method produced better results and was less cumbersome. While traditional, julienning the ginger was not only laborious, it left fibrous pieces in the finished dish. Using a wand-style grater to finely grate the ginger distributed it better. The clean flavor and light texture of grapeseed oil ideal for this dish, but vegetable oil will work fine as well. In a large skillet over medium-high heat, bring the water and salt to a boil. Pile the chard into the pan and cover (the lid may not close completely). Cook until the chard is wilted, about 5 minutes, stirring halfway through. Remove the lid and continue to cook, stirring occasionally, until most of the liquid has evaporated, 1 to 3 minutes. Transfer the chard to a serving platter and wipe out the skillet. Distribute the scallions, ginger and serrano evenly over the chard. Add both oils to the skillet and return to medium-high heat until very hot, 1 to 2 minutes. Pour the oils directly over the greens and aromatics (you should hear them sizzle) and toss to distribute. 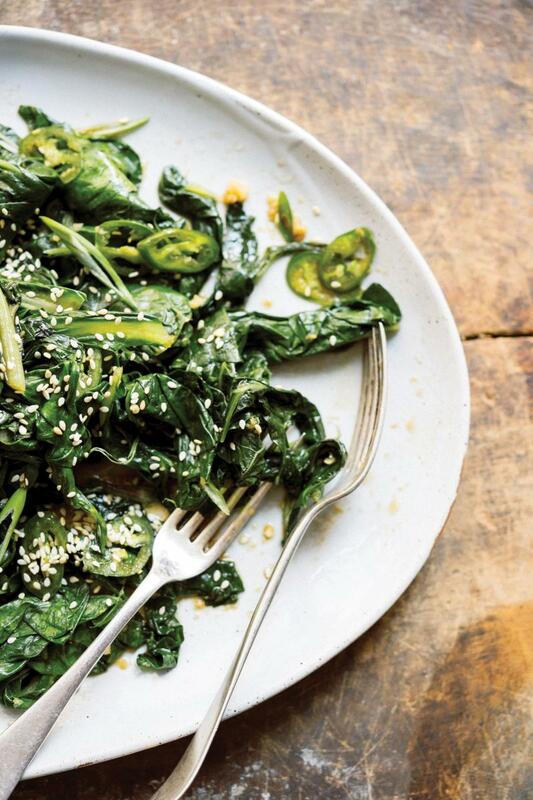 Drizzle the vinegar and soy sauce over the chard and toss again. Sprinkle with the sesame seeds, if using. Don’t use the chard stems in this dish, but also don’t throw them away! The stems are tougher than the leaves and won’t cook through in the short time it takes to wilt the leaves. Chard stems do have good flavor, however, and can be sautéed, pickled or added to soups and stews. New episodes of Milk Street Kitchen air every Saturday at 4pm on WGBH 2.